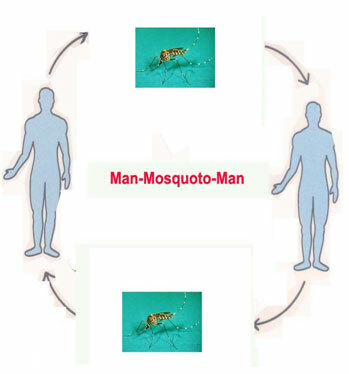 The mosquito becomes infective when it bites a Dengue patient for a blood meal and the virus from the patient enters the mosquito where it multiplies. Now this infective mosquito when bites a healthy person, it transmits the disease. Female Mosquito needs blood meals for development and laying of eggs. In one day it bites 3-5 people to satisfy its blood meals requirement. This is so because the mosquito is Day biter and moment it bites a human being it is moved away by the person so it does not get sufficient time to take Blood meal from the single human body. All possible mosquito breeding sources and sites should be detected & eliminated. If still the source can not be reduced Zonal Municipal Health Authorities must be contacted immediately. Wearing of full sleeve shirts and full pants with socks during the Transmission season.